Title searches prevent mistakes like the Creamery Bldg. 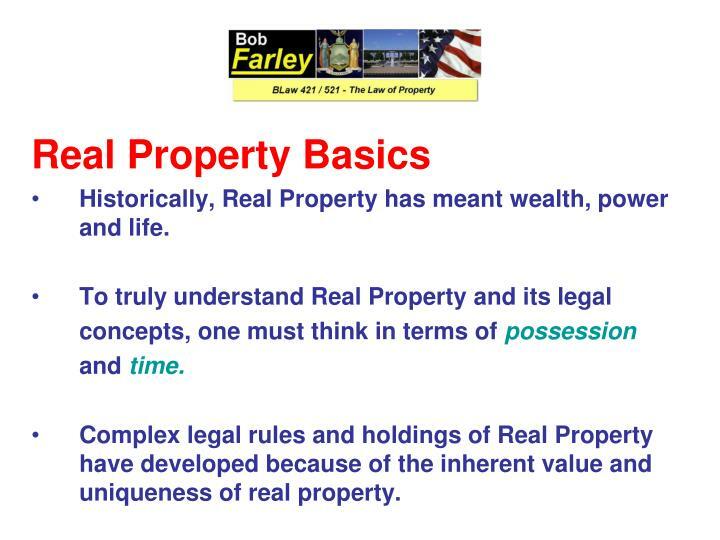 Historically, Real Property has meant wealth, power and life. Complex legal rules and holdings of Real Property have developed because of the inherent value and uniqueness of real property. There are two types of taxes, and really only two types of taxes, which tax you on what you own or have, not upon what you earn or acquire. 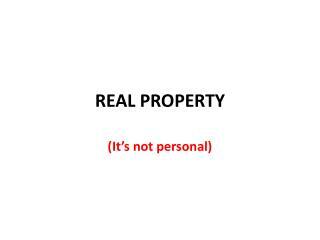 These two types of taxes are Real Property Taxes and Estate (or Death) Taxes. In New York State, Real Property Taxes are used to finance local governments and schools. 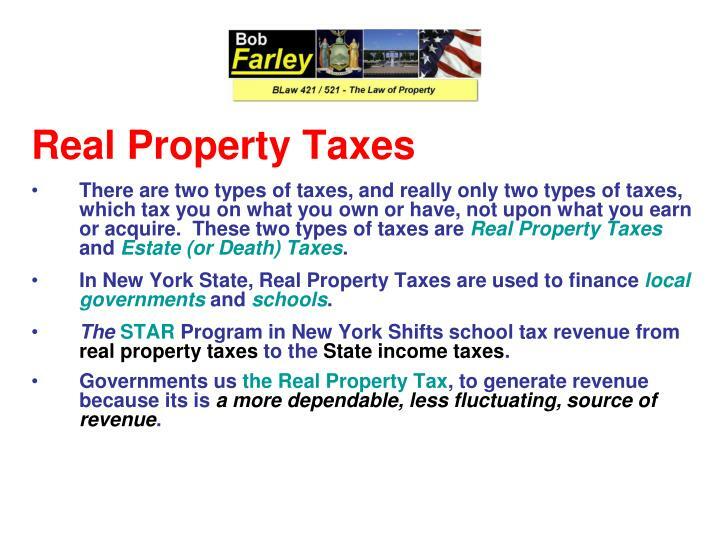 TheSTAR Program in New York Shifts school tax revenue from real property taxes to the State income taxes. Governments us the Real Property Tax, to generate revenue because its is a more dependable, less fluctuating, source of revenue. 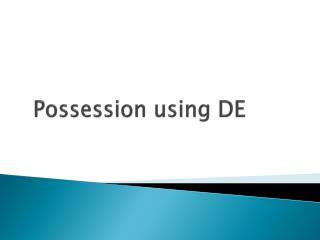 Possession – Does the interest allow possession of the realty? 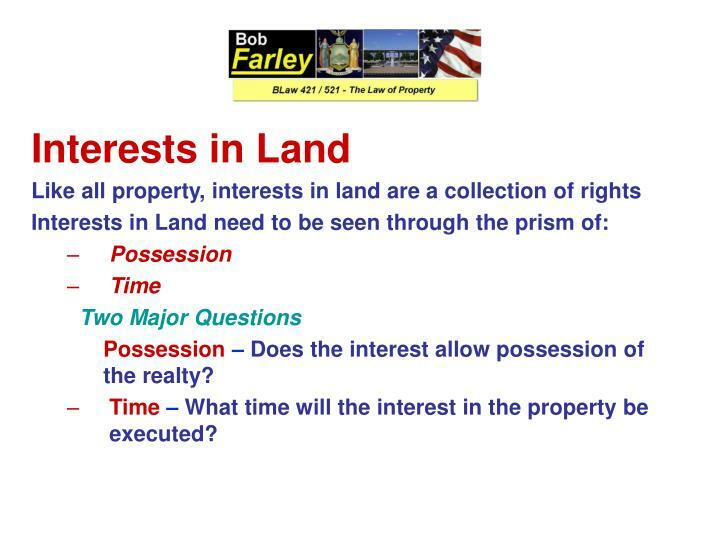 Time – What time will the interest in the property be executed? 1. 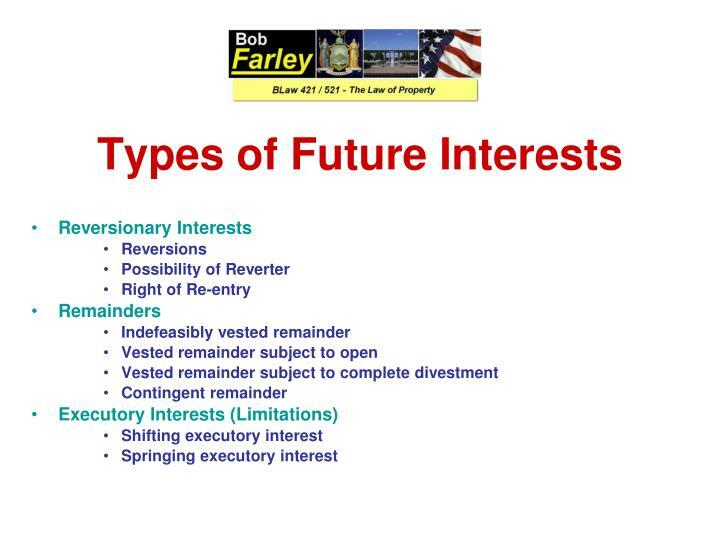 Invests the owner with all possible rights (E-PUT) now and in the future. 2. 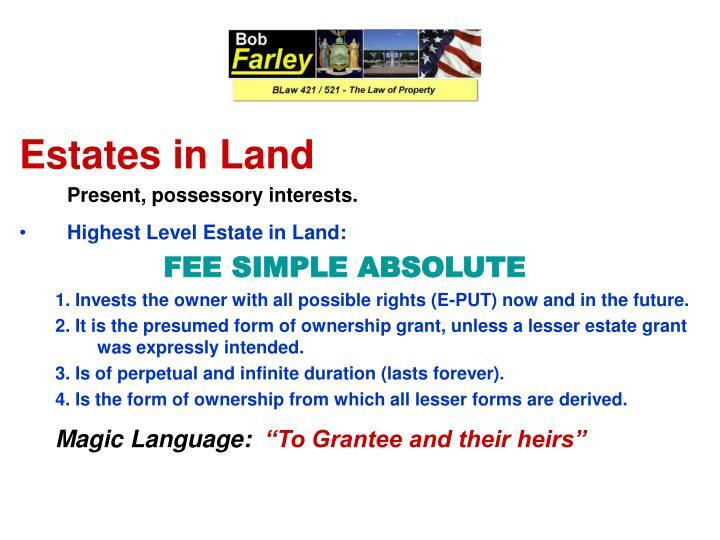 It is the presumed form of ownership grant, unless a lesser estate grant was expressly intended. 3. Is of perpetual and infinite duration (lasts forever). 4. 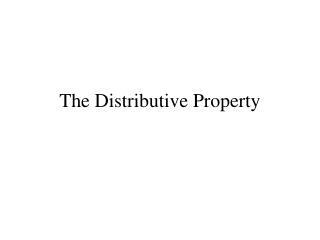 Is the form of ownership from which all lesser forms are derived. that can be terminated by the happening of a specified event. These are a lesser estate than fee simple absolute. 1. 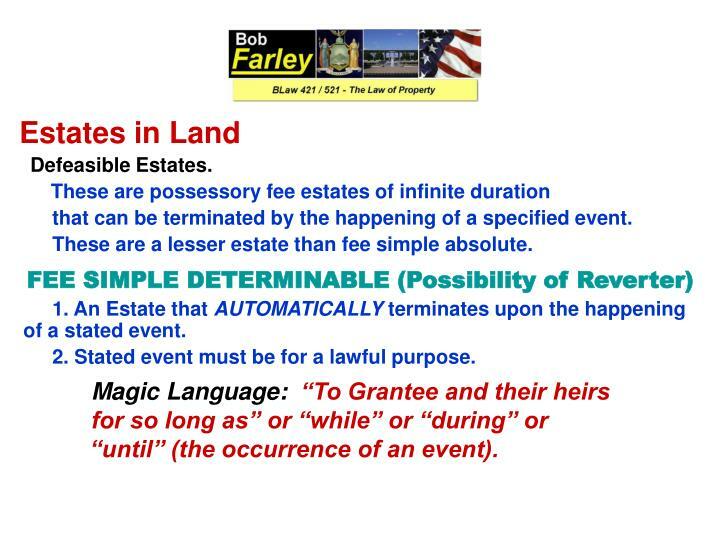 An Estate that AUTOMATICALLY terminates upon the happening of a stated event. 2. Stated event must be for a lawful purpose. “until” (the occurrence of an event). 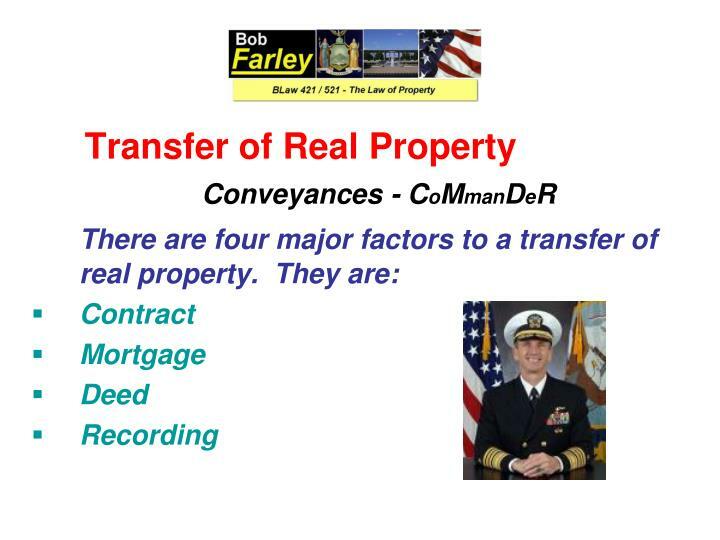 of a stated event and the taking of an action of the party granted such rights by the transferring owner. 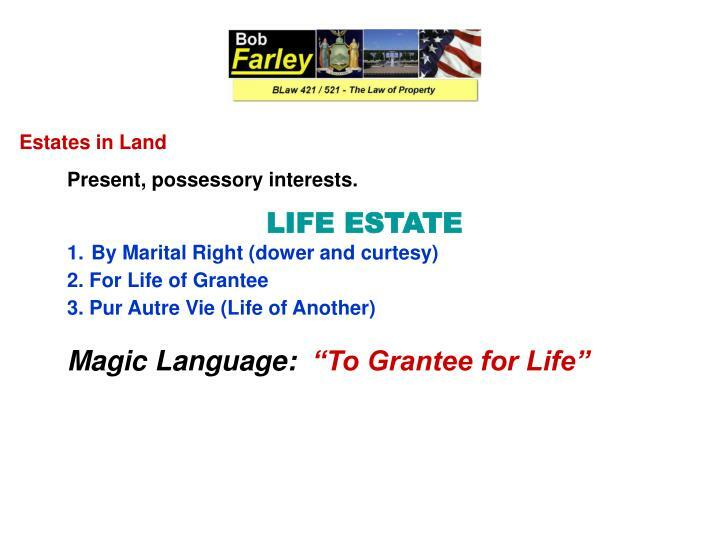 Magic Language: “To Grantee and their heirs upon the condition that” or “provided that” or “but if” or “if it happens that” (the occurrence of an event). 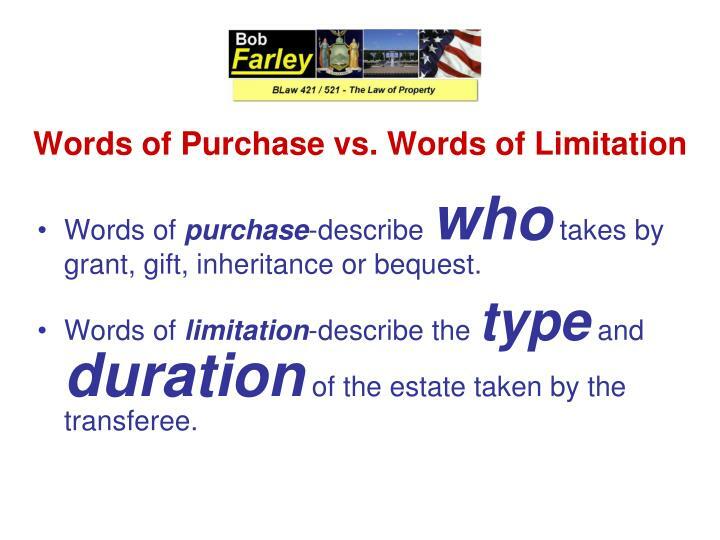 Words of purchase-describe who takes by grant, gift, inheritance or bequest. Words of limitation-describe the type and duration of the estate taken by the transferee. What are the words of purchase? What are the words of limitation? The remainder is the estate in time. The reversion is the estate in time. 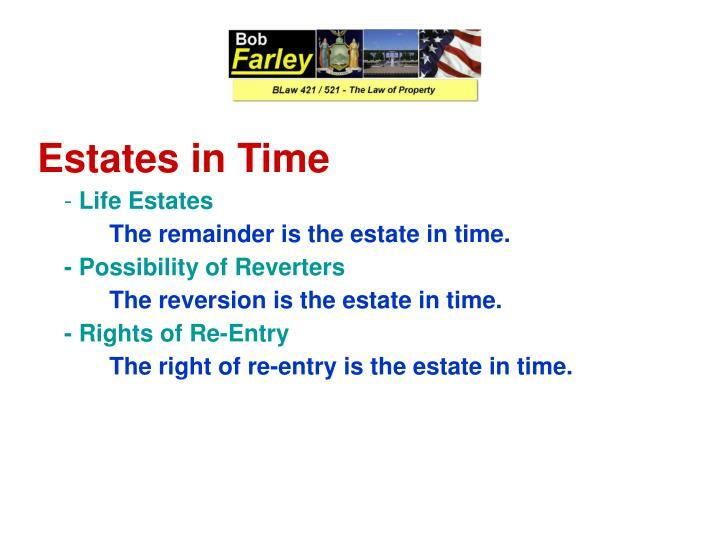 The right of re-entry is the estate in time. No Right of Survivorship. Freely alienable. 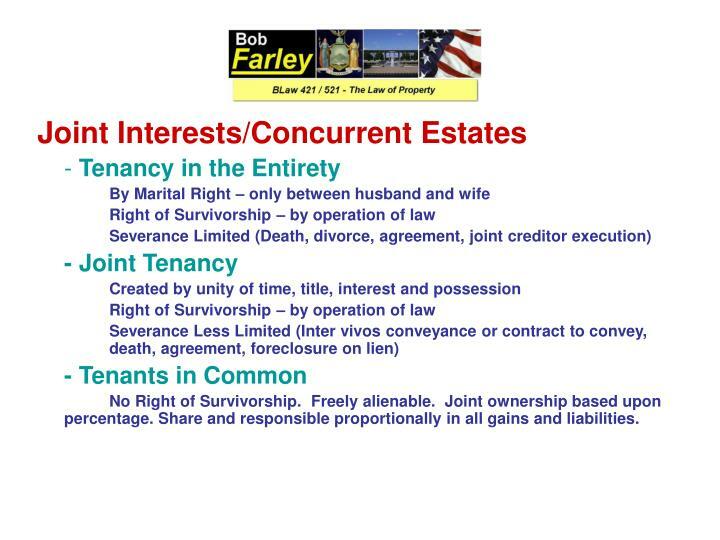 Joint ownership based upon percentage. Share and responsible proportionally in all gains and liabilities. 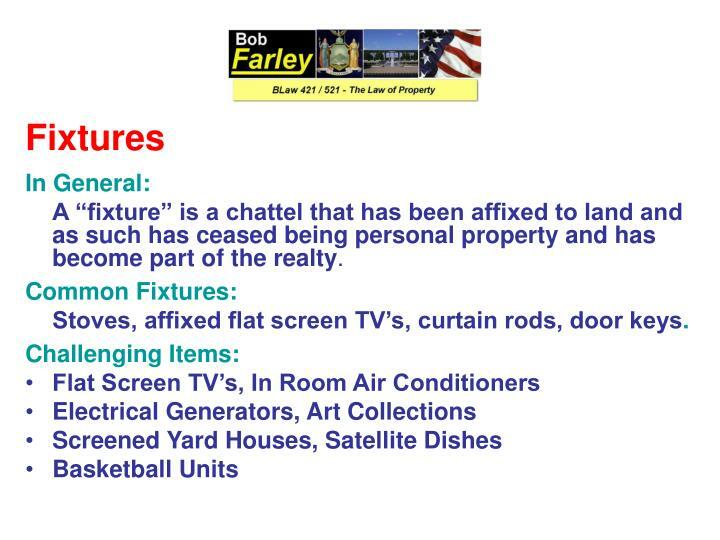 A “fixture” is a chattel that has been affixed to land and as such has ceased being personal property and has become part of the realty. Stoves, affixed flat screen TV’s, curtain rods, door keys. Adverse PossessionGenerallyAt the core of adverse possession is a statute of limitationsStatutes of Limitation bar suits after some period of time after the cause of action accruesUnder New York State Law (Section 212 (a) of the CPLR) the statute of limitations (time period for adverse possession) for an action to recover real property is 10 years. Adverse PossessionBasic Issues* In context of actions to recover possession of real propertythe cause of action accrues at the time the wrongdoer enters and takes possession of the property. 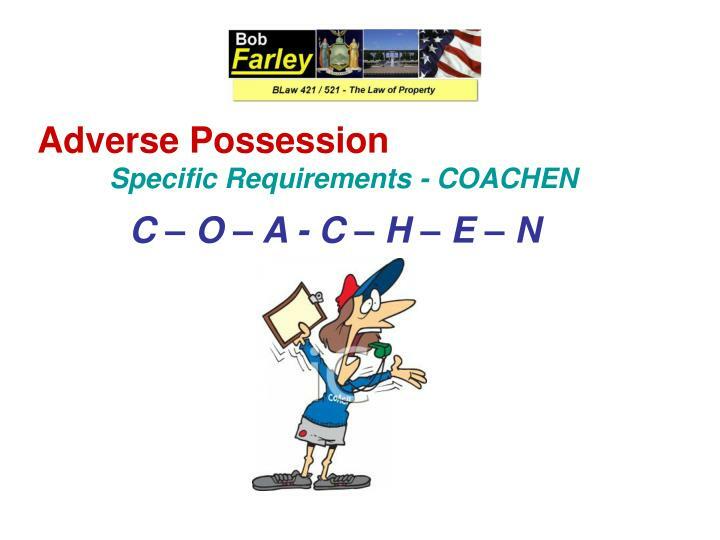 * A Cause of action for wrongful possession differs from cause of action for trespass. 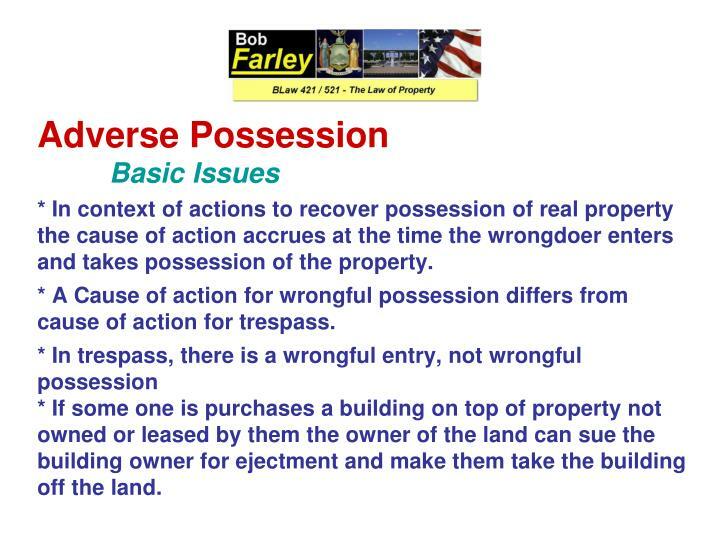 * In trespass, there is a wrongful entry, not wrongful possession* If some one is purchases a building on top of property not owned or leased by them the owner of the land can sue the building owner for ejectment and make them take the building off the land. - Under New York State Law, an adverse possessor may tack (or add to) his time under the statute of limitations, the adverse possession time of the previous land owner. 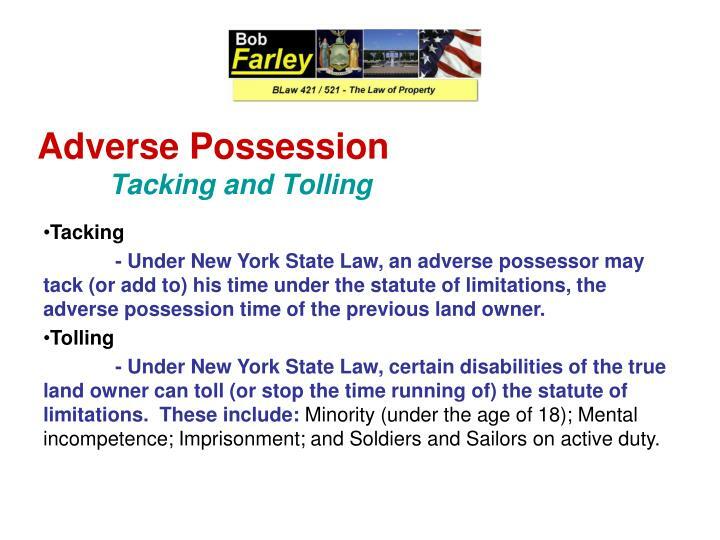 - Under New York State Law, certain disabilities of the true land owner can toll (or stop the time running of) the statute of limitations. These include: Minority (under the age of 18); Mental incompetence; Imprisonment; and Soldiers and Sailors on active duty. 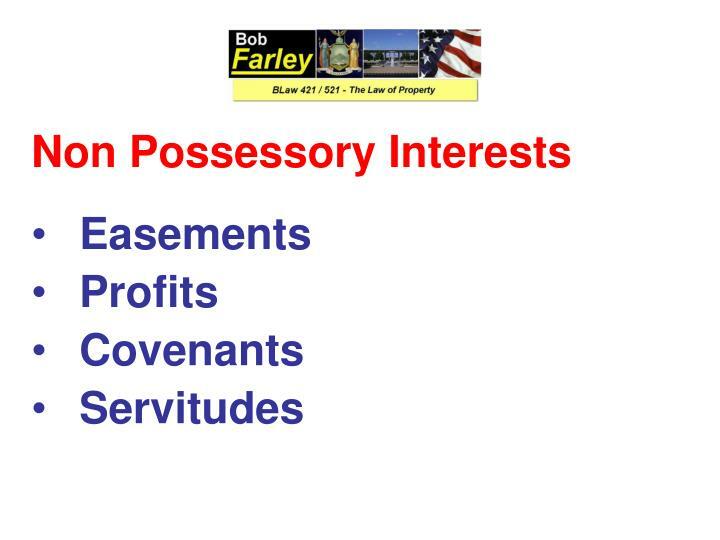 “Possessory Interests”, are interests in real property that either are, or will be (pre-vested interests) possessed by the holder of the property. 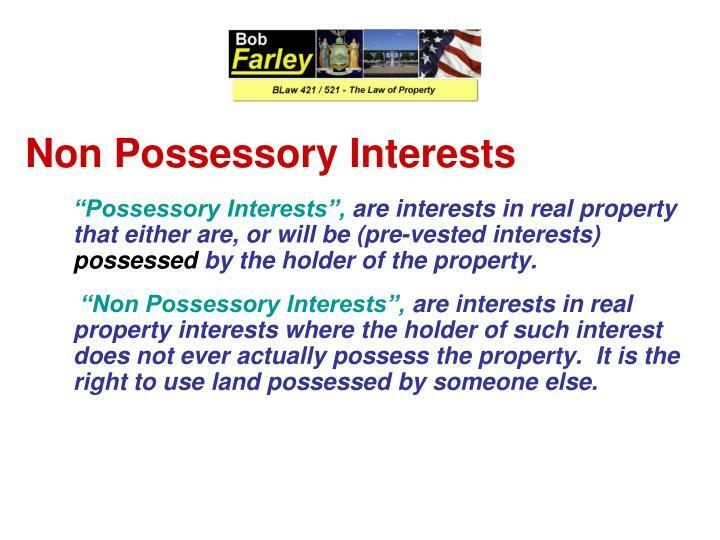 “Non Possessory Interests”, are interests in real property interests where the holder of such interest does not ever actually possess the property. It is the right to use land possessed by someone else. 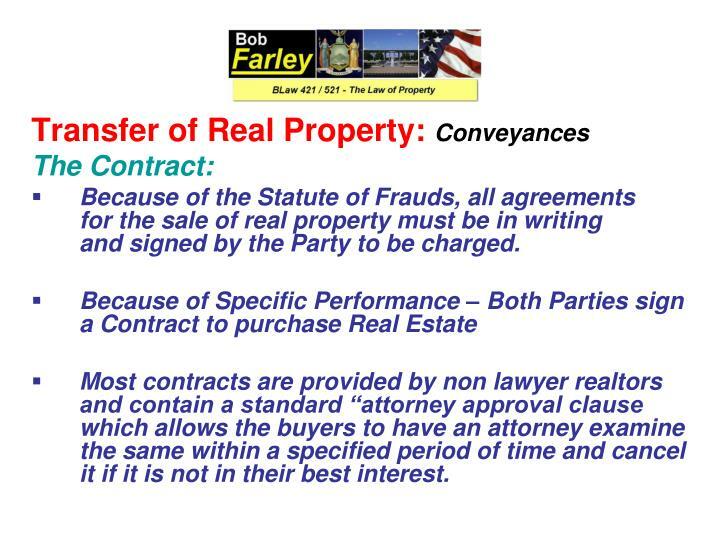 Because of the Statute of Frauds, all agreements for the sale of real property must be in writing and signed by the Party to be charged. 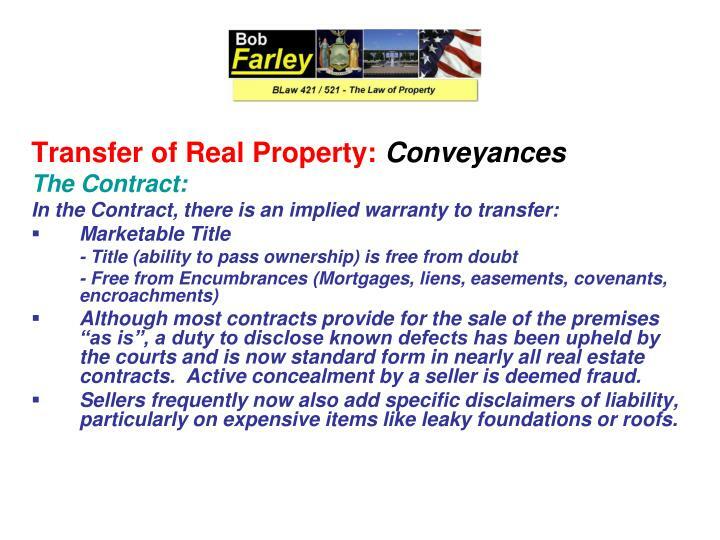 Most contracts are provided by non lawyer realtors and contain a standard “attorney approval clause which allows the buyers to have an attorney examine the same within a specified period of time and cancel it if it is not in their best interest. Although most contracts provide for the sale of the premises “as is”, a duty to disclose known defects has been upheld by the courts and is now standard form in nearly all real estate contracts. Active concealment by a seller is deemed fraud. Sellers frequently now also add specific disclaimers of liability, particularly on expensive items like leaky foundations or roofs. 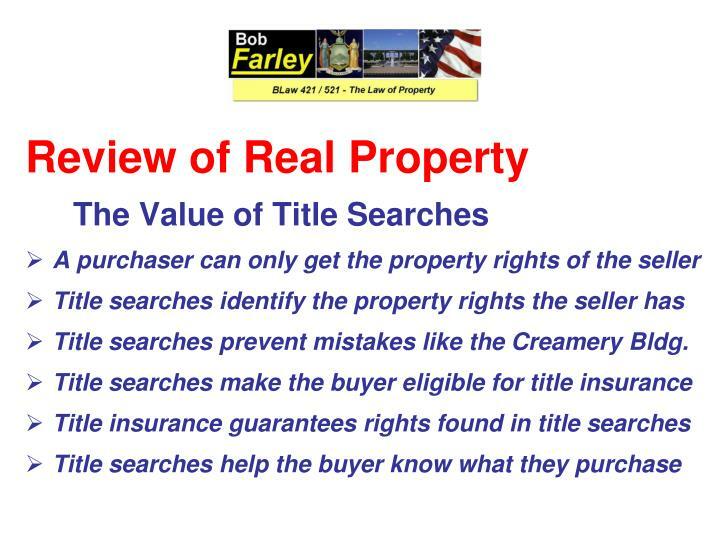 The Real Estate Agent is an “Agent” for the Seller, and the Seller by means of a written listing agreement is liable for their commission, usually between 6 to 7 percent of the sale value. 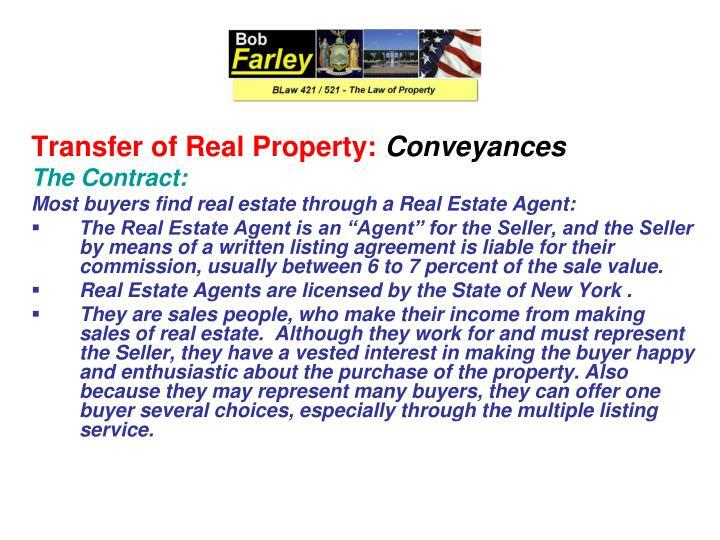 Real Estate Agents are licensed by the State of New York . They are sales people, who make their income from making sales of real estate. Although they work for and must represent the Seller, they have a vested interest in making the buyer happy and enthusiastic about the purchase of the property. Also because they may represent many buyers, they can offer one buyer several choices, especially through the multiple listing service. 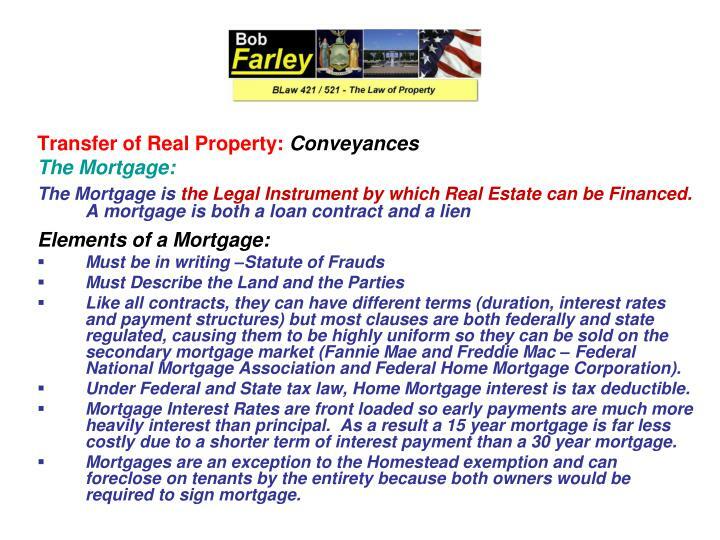 Like all contracts, they can have different terms (duration, interest rates and payment structures) but most clauses are both federally and state regulated, causing them to be highly uniform so they can be sold on the secondary mortgage market (Fannie Mae and Freddie Mac – Federal National Mortgage Association and Federal Home Mortgage Corporation). Under Federal and State tax law, Home Mortgage interest is tax deductible. Mortgage Interest Rates are front loaded so early payments are much more heavily interest than principal. As a result a 15 year mortgage is far less costly due to a shorter term of interest payment than a 30 year mortgage. Mortgages are an exception to the Homestead exemption and can foreclose on tenants by the entirety because both owners would be required to sign mortgage. First and Second Mortgages – A property may contain more than one mortgage. The first mortgage is the first in time (and usually the first in right). The second or secondary mortgage (often a home equity loan) is financing on whatever amount between the amount of the first mortgage and the amount of the value of the home (i.e. the equity). Amortized Mortgage – A mortgage for a specified term of years – usually 15 or 30 years – where the principal and interest are amortized over the period of the loan in equal payments. Balloon Payment Mortgage - A mortgage for a specified term of years where after a period of equal loan payments, a single, large balloon payment is due upon the conclusion of the loan. Assumed Mortgage – A mortgage taken by a previous owner of the property that is assumed (i.e. taken over) by a subsequent owner. 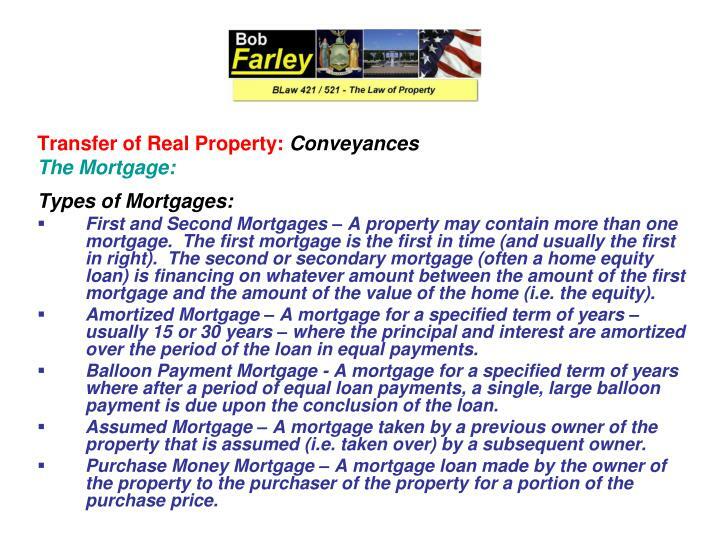 Purchase Money Mortgage – A mortgage loan made by the owner of the property to the purchaser of the property for a portion of the purchase price. 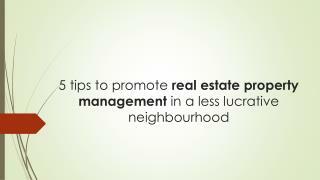 Prime Rate Mortgages – A mortgage made at market interest rates. Fixed Rate Mortgage – A mortgage made at a rate of interest consistent and unchanging during the course of the loan. Variable Rate Mortgage – A mortgage made at a rate of interest that fluctuates during the course of the loan (most often tied to prime rates or treasury bills plus a fee amount). Convertible Mortgage - A variable rate mortgage convertible for a time period during the term to a fixed rate upon the payment of a fee. Sub Prime Mortgage – A mortgage with a variable rate that begins at an interest rate below the prime rate. Due on Sale Clause – Most mortgages require the mortgage to be paid off in total upon the sale of the property. An assumable mortgage is not due on sale. 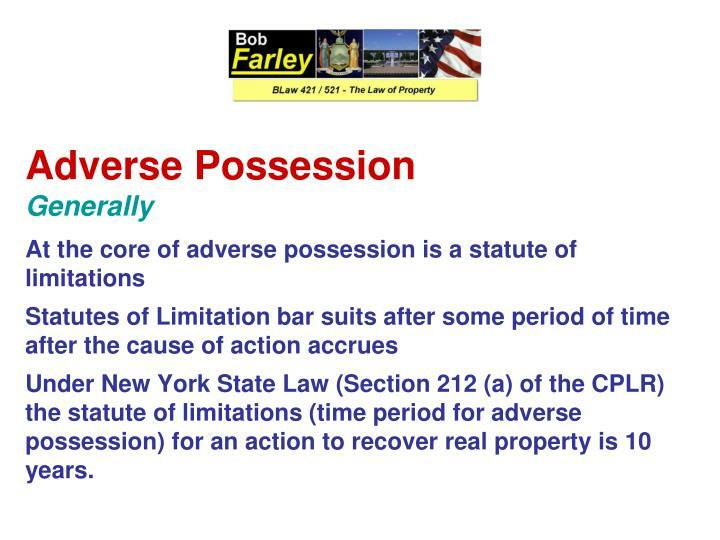 Foreclosure – The right of the Mortgagor to repossess and sell the property for the mortgagee’s failure to provide payment of the mortgage pursuant to its terms. 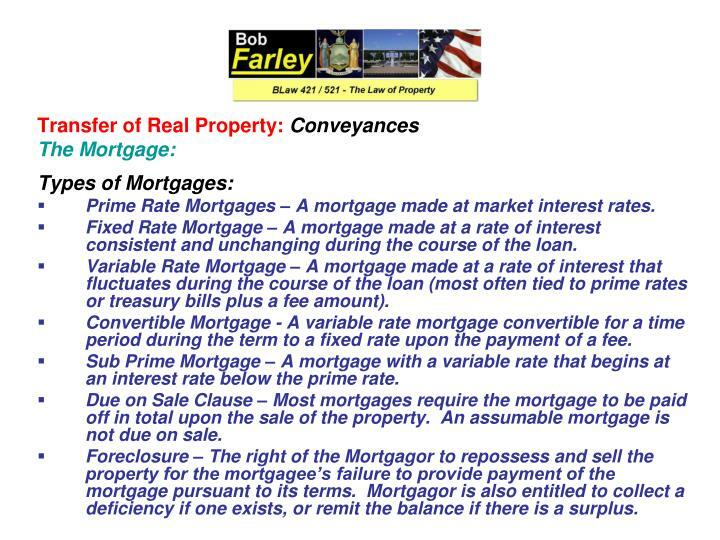 Mortgagor is also entitled to collect a deficiency if one exists, or remit the balance if there is a surplus. 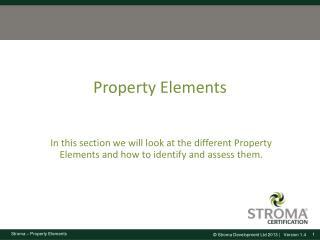 Must provide “words of intent” – How the property is transferred and held – i.e. 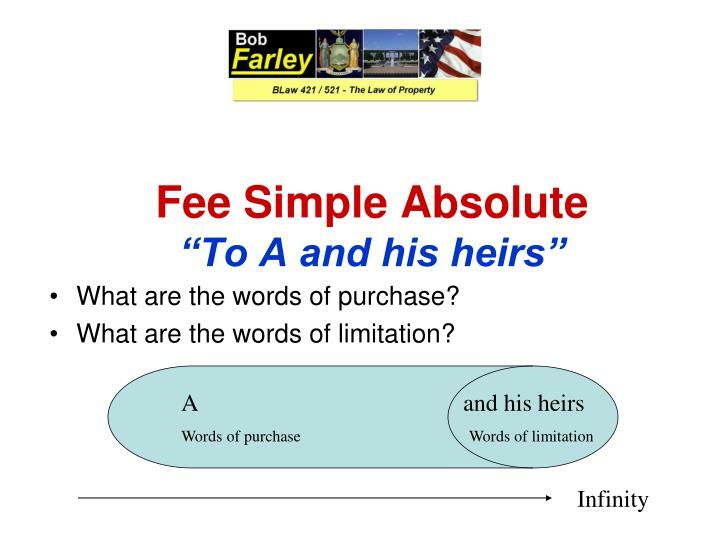 fee simple absolute or any terms of limitation. 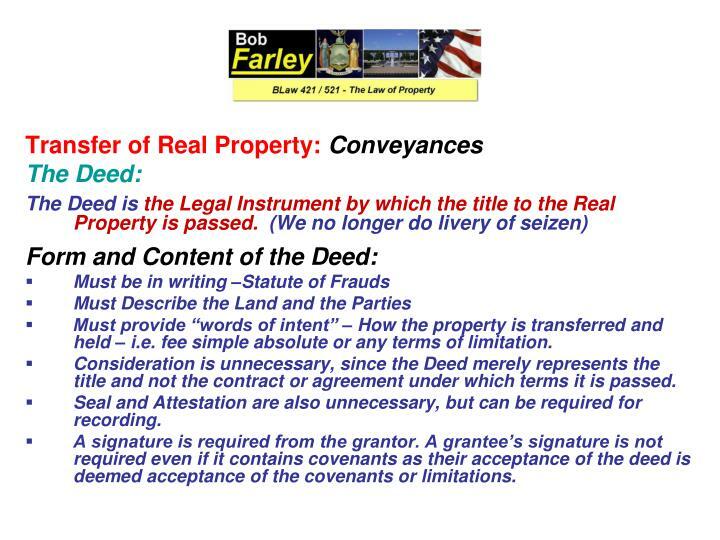 Consideration is unnecessary, since the Deed merely represents the title and not the contract or agreement under which terms it is passed. 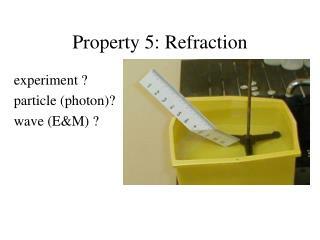 Seal and Attestation are also unnecessary, but can be required for recording. 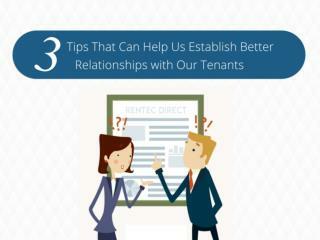 A signature is required from the grantor. A grantee’s signature is not required even if it contains covenants as their acceptance of the deed is deemed acceptance of the covenants or limitations. 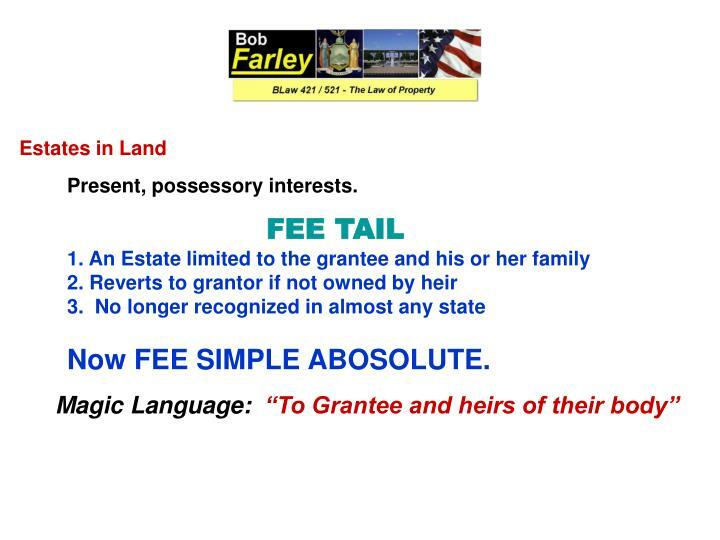 Title to property passes upon effective delivery, as a result returning it back to the grantor has no effect, since title has already passed. 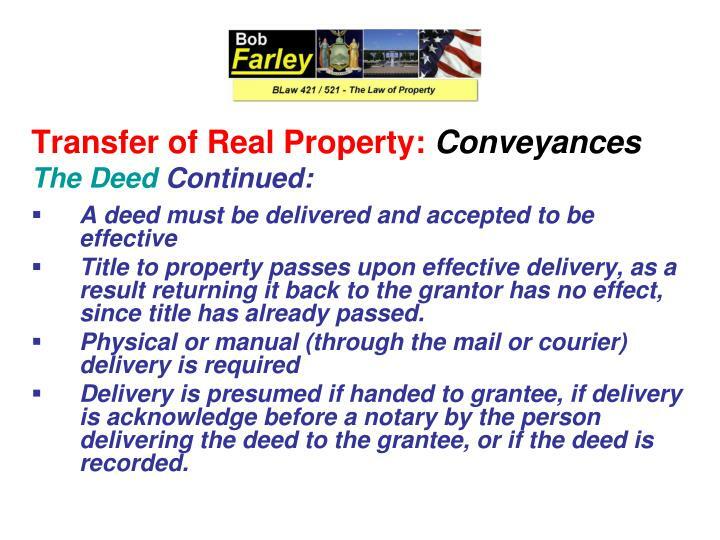 Delivery is presumed if handed to grantee, if delivery is acknowledge before a notary by the person delivering the deed to the grantee, or if the deed is recorded. 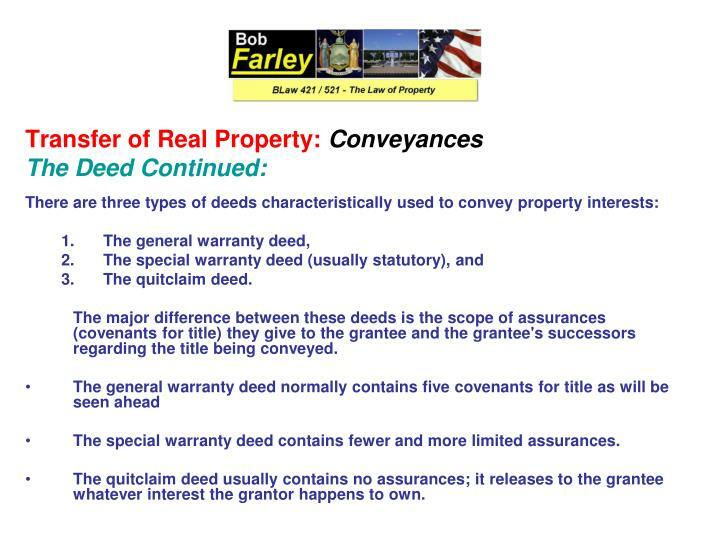 The major difference between these deeds is the scope of assurances (covenants for title) they give to the grantee and the grantee's successors regarding the title being conveyed. 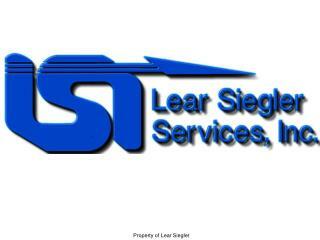 The special warranty deed contains fewer and more limited assurances. The quitclaim deed usually contains no assurances; it releases to the grantee whatever interest the grantor happens to own. 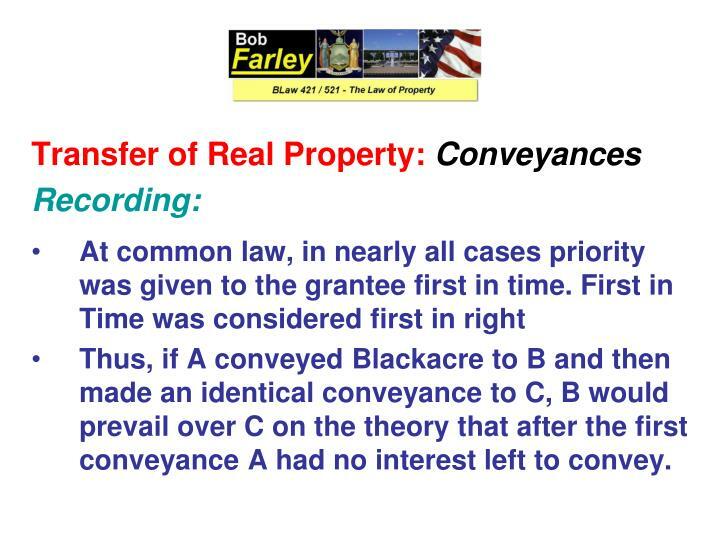 Thus, if A conveyed Blackacre to B and then made an identical conveyance to C, B would prevail over C on the theory that after the first conveyance A had no interest left to convey. 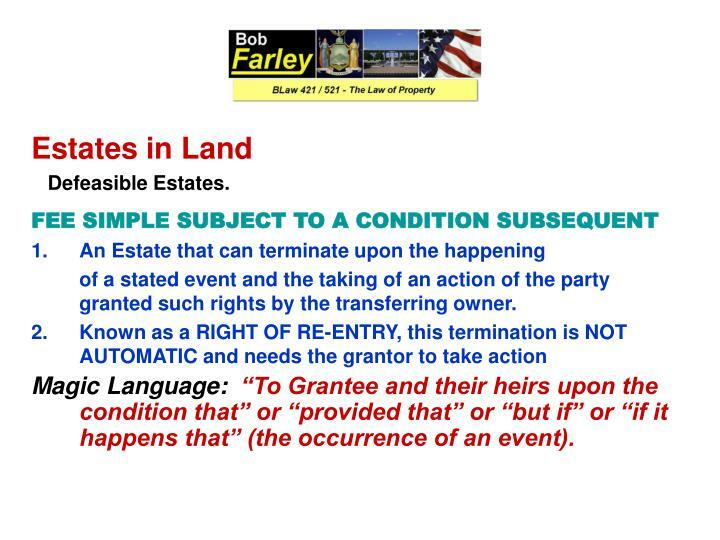 Statutes known as "recording acts" require a grantee to make some sort of recordation so as to give "notice to the world" that title to certain property has already been conveyed, and thus to put subsequent purchasers on guard. These statutes are in effect in some form in every state. 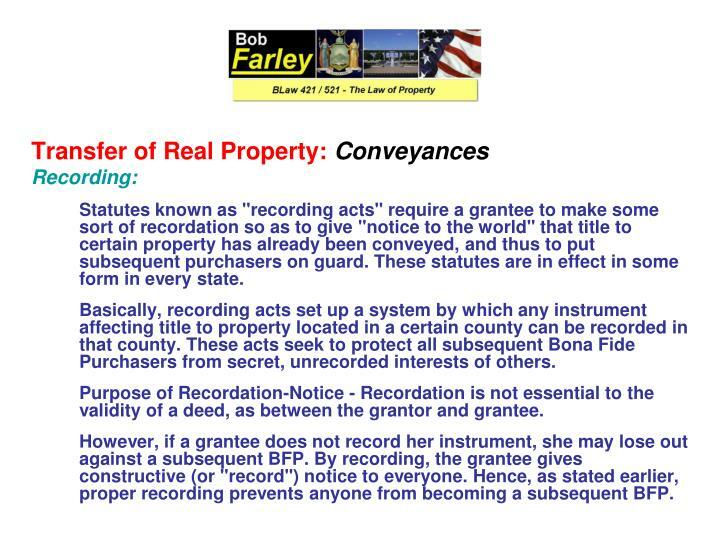 Basically, recording acts set up a system by which any instrument affecting title to property located in a certain county can be recorded in that county. These acts seek to protect all subsequent Bona Fide Purchasers from secret, unrecorded interests of others. Purpose of Recordation-Notice - Recordation is not essential to the validity of a deed, as between the grantor and grantee. However, if a grantee does not record her instrument, she may lose out against a subsequent BFP. By recording, the grantee gives constructive (or "record") notice to everyone. Hence, as stated earlier, proper recording prevents anyone from becoming a subsequent BFP. Practically every kind of deed, mortgage, contract to convey, or other instrument creating or affecting an interest in land can be recorded. 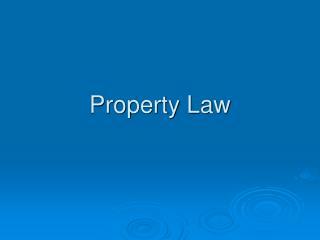 Note: A judgment or decree affecting title to property can also be recorded. 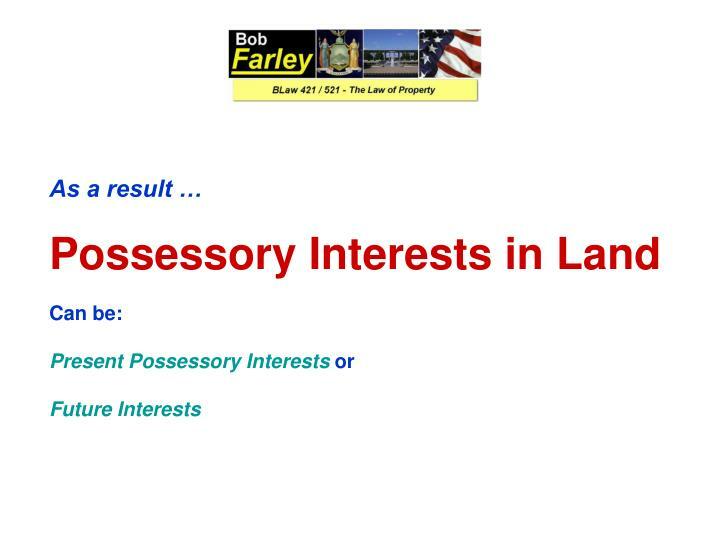 And, even before judgment, where a lawsuit is pending that may affect title to property, any party to the action can record a lispendens (notice of pending action), which will effectively put third parties on notice of all claims pending in the lawsuit. Most recording statutes provide that, in order to be recorded, a deed must be acknowledged by the grantor before a notary public. This requirement offers some protection against forgery. 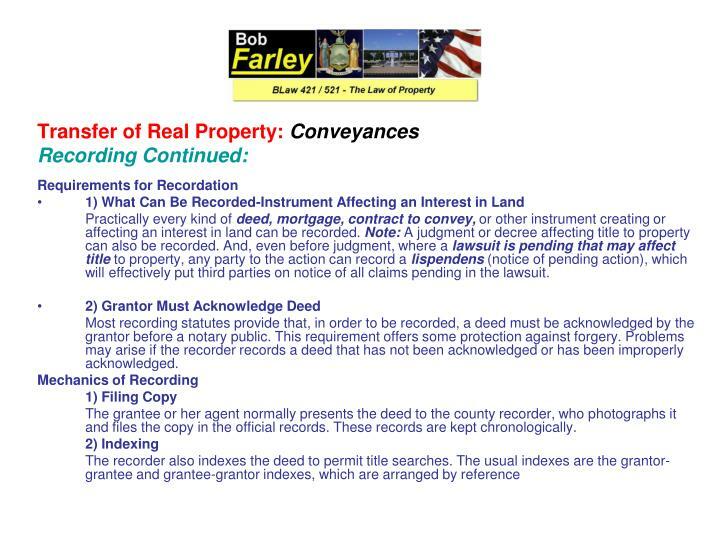 Problems may arise if the recorder records a deed that has not been acknowledged or has been improperly acknowledged. The grantee or her agent normally presents the deed to the county recorder, who photographs it and files the copy in the official records. These records are kept chronologically. 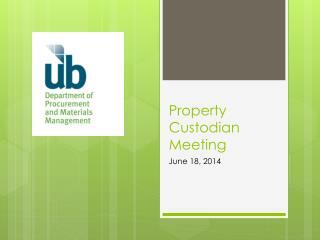 The law has long recognized the concept that one must not use one’s property to injure another’s property. 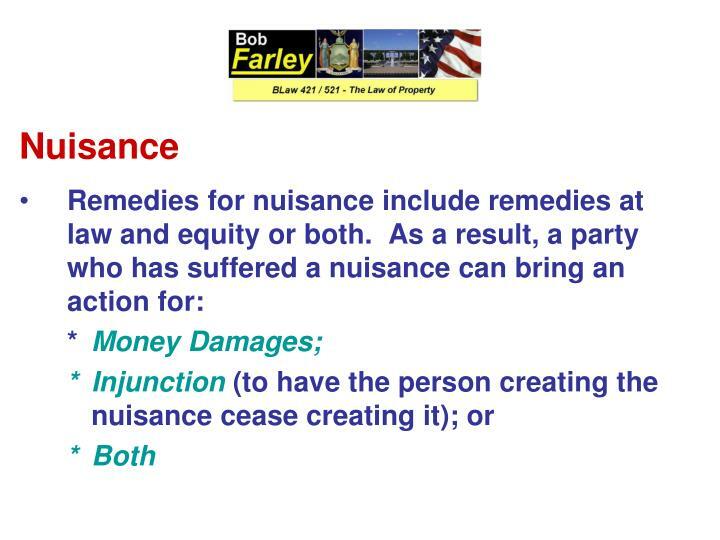 When this type of conduct occurs it can legally be classified as Nuisance. 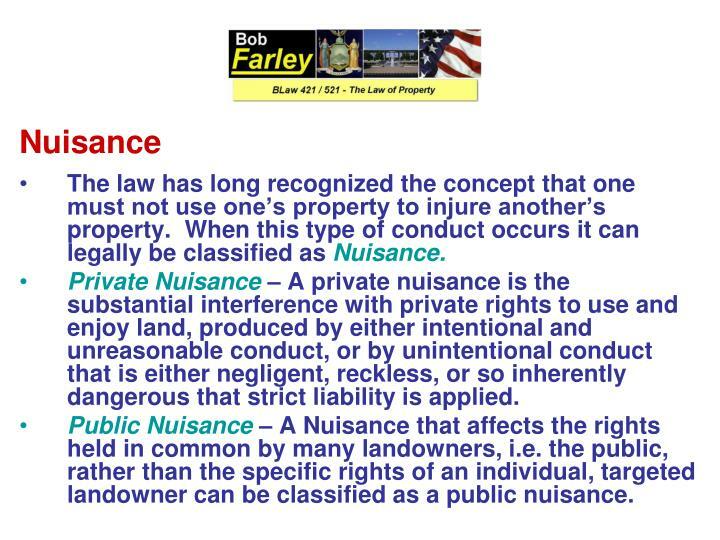 Private Nuisance – A private nuisance is the substantial interference with private rights to use and enjoy land, produced by either intentional and unreasonable conduct, or by unintentional conduct that is either negligent, reckless, or so inherently dangerous that strict liability is applied. 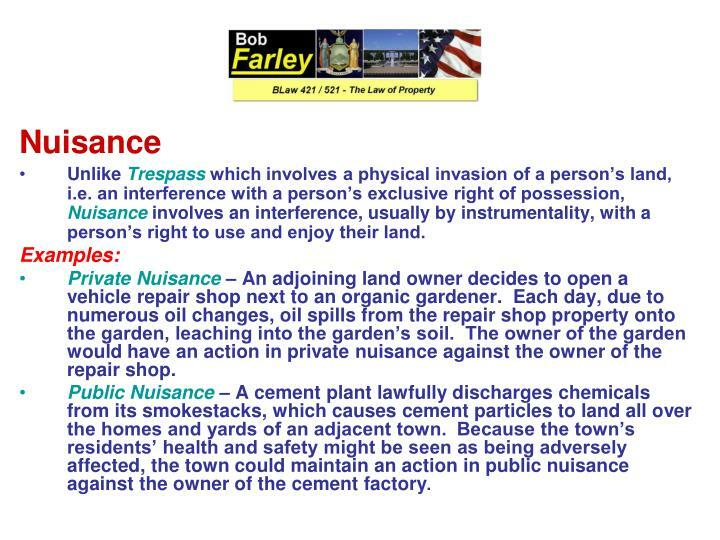 Public Nuisance – A Nuisance that affects the rights held in common by many landowners, i.e. the public, rather than the specific rights of an individual, targeted landowner can be classified as a public nuisance. Unlike Trespass which involves a physical invasion of a person’s land, i.e. 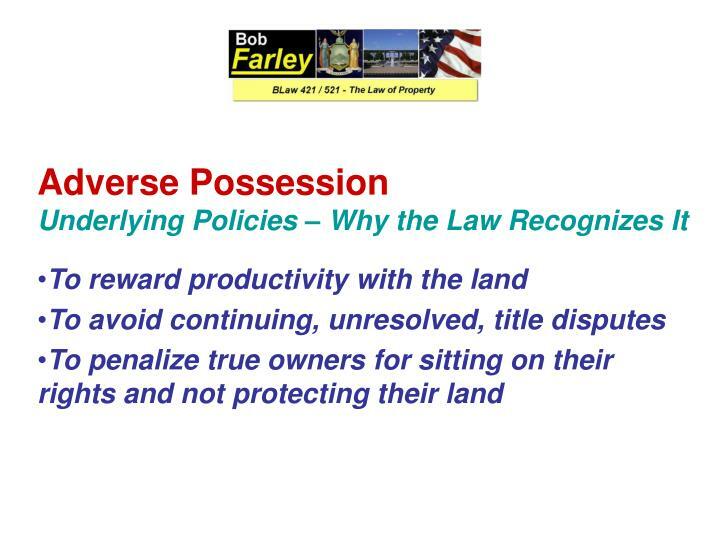 an interference with a person’s exclusive right of possession, Nuisance involves an interference, usually by instrumentality, with a person’s right to use and enjoy their land. Private Nuisance – An adjoining land owner decides to open a vehicle repair shop next to an organic gardener. Each day, due to numerous oil changes, oil spills from the repair shop property onto the garden, leaching into the garden’s soil. The owner of the garden would have an action in private nuisance against the owner of the repair shop. Public Nuisance – A cement plant lawfully discharges chemicals from its smokestacks, which causes cement particles to land all over the homes and yards of an adjacent town. Because the town’s residents’ health and safety might be seen as being adversely affected, the town could maintain an action in public nuisance against the owner of the cement factory. 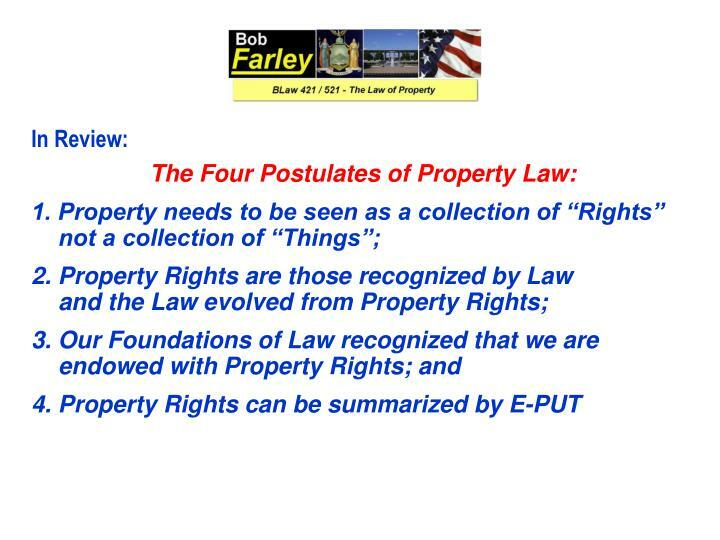 The law has also long recognized the concept that a property owner is entitled to use one’s property with out interference from others, and that property owners have an inherent right to exclude those who may so wish to so interfere. When this type of physical interference occurs, it can legally be classified as Trespass. Trespass Defined – At common law, any intentional and unprivileged entry onto land owned or occupied by another constituted a trespass. Although recent developments in the law have focused on carving out special exceptions to liability, the basic liability standards have not changed. 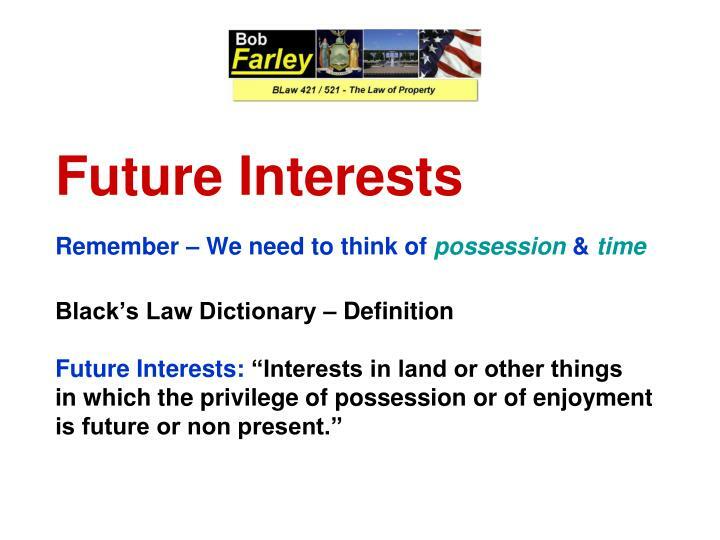 Intent - The element of intent has a special meaning in trespass law. A trespasser is strictly liable; good faith, knowledge, and fault are irrelevant. A person commits trespass, even if they merely walk across a property owner’s land, mistakenly believing it to be their own. 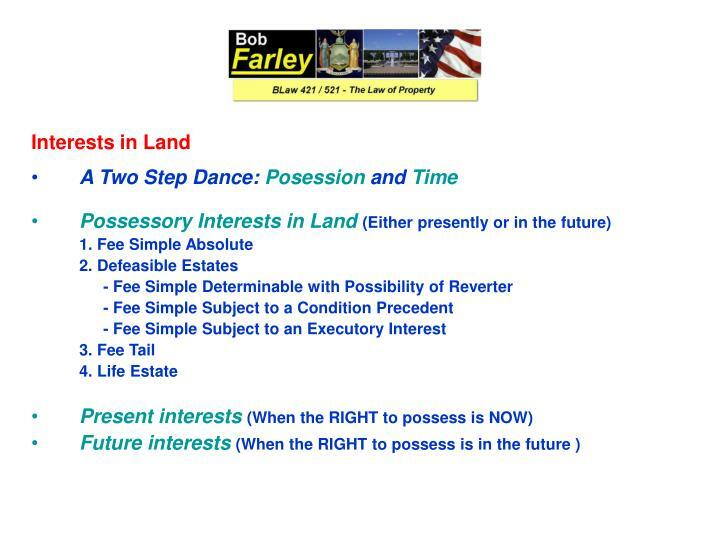 The trespass doctrine requires only that the trespasser intended to enter onto the land as a matter of free choice, not that he had a subjective intent to trespass or even knew he was trespassing. 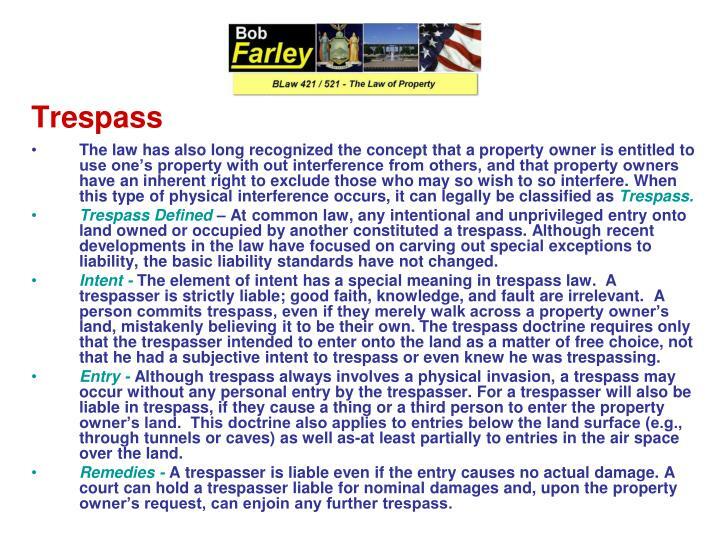 Entry - Although trespass always involves a physical invasion, a trespass may occur without any personal entry by the trespasser. 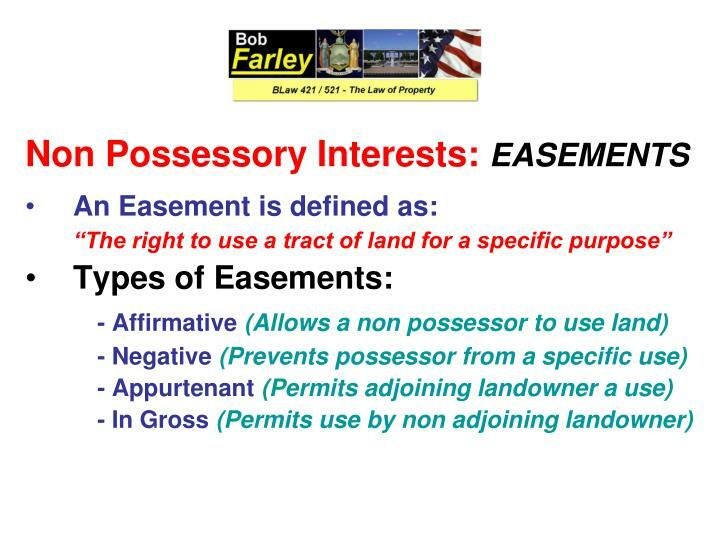 For a trespasser will also be liable in trespass, if they cause a thing or a third person to enter the property owner’s land. This doctrine also applies to entries below the land surface (e.g., through tunnels or caves) as well as-at least partially to entries in the air space over the land. 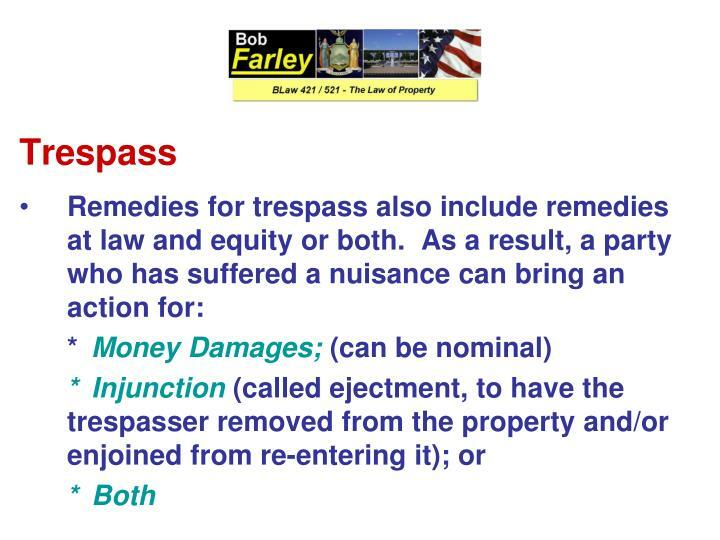 Remedies - A trespasser is liable even if the entry causes no actual damage. A court can hold a trespasser liable for nominal damages and, upon the property owner’s request, can enjoin any further trespass. 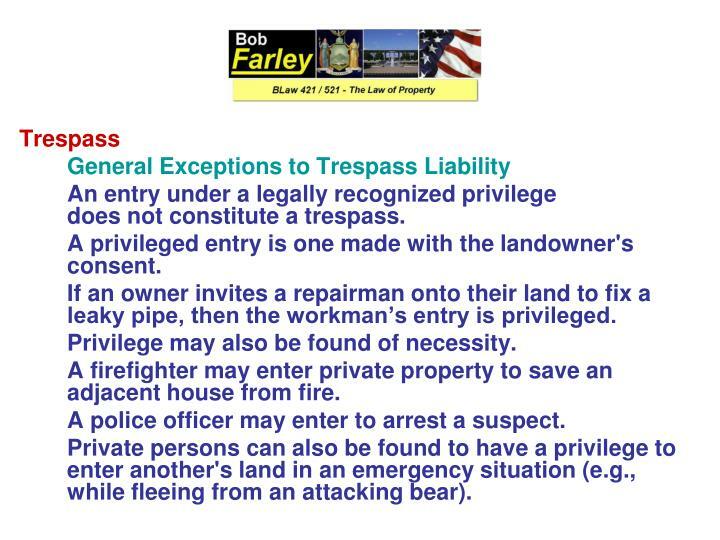 An entry under a legally recognized privilege does not constitute a trespass. A privileged entry is one made with the landowner's consent. If an owner invites a repairman onto their land to fix a leaky pipe, then the workman’s entry is privileged. Privilege may also be found of necessity. A firefighter may enter private property to save an adjacent house from fire. A police officer may enter to arrest a suspect. Private persons can also be found to have a privilege to enter another's land in an emergency situation (e.g., while fleeing from an attacking bear). 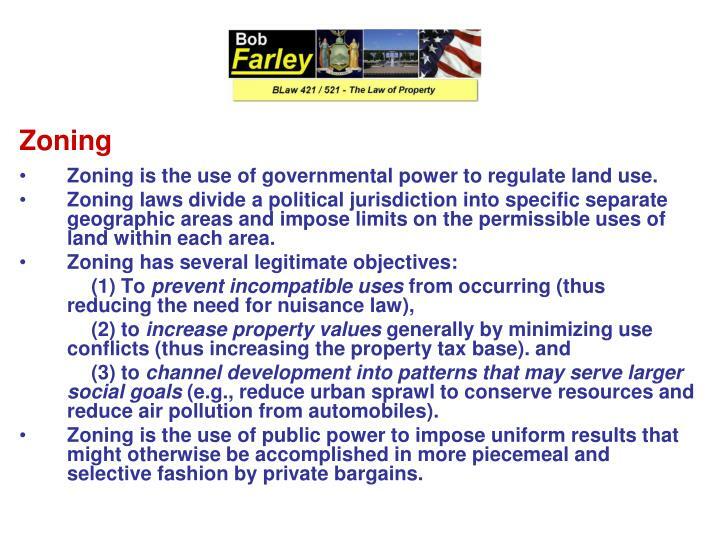 Zoning is the use of governmental power to regulate land use. 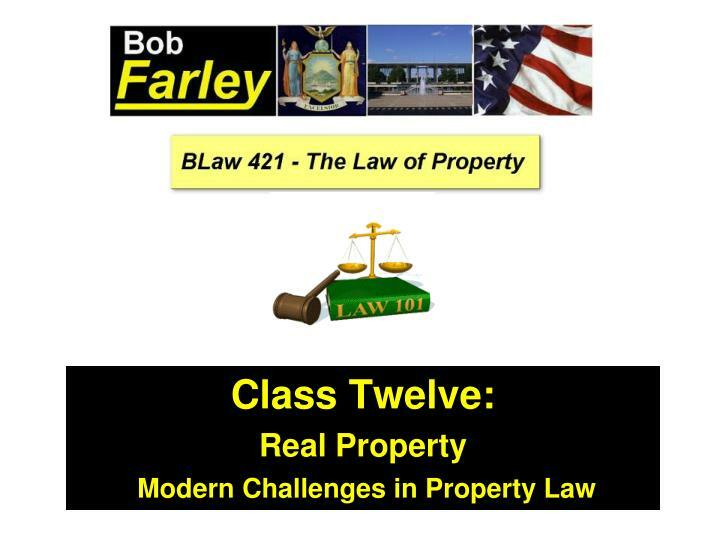 Zoning laws divide a political jurisdiction into specific separate geographic areas and impose limits on the permissible uses of land within each area. 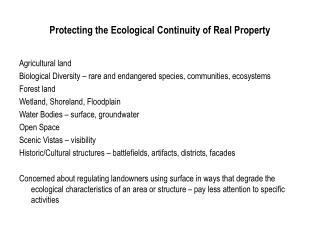 (3) to channel development into patterns that may serve larger social goals (e.g., reduce urban sprawl to conserve resources and reduce air pollution from automobiles). Zoning is the use of public power to impose uniform results that might otherwise be accomplished in more piecemeal and selective fashion by private bargains. 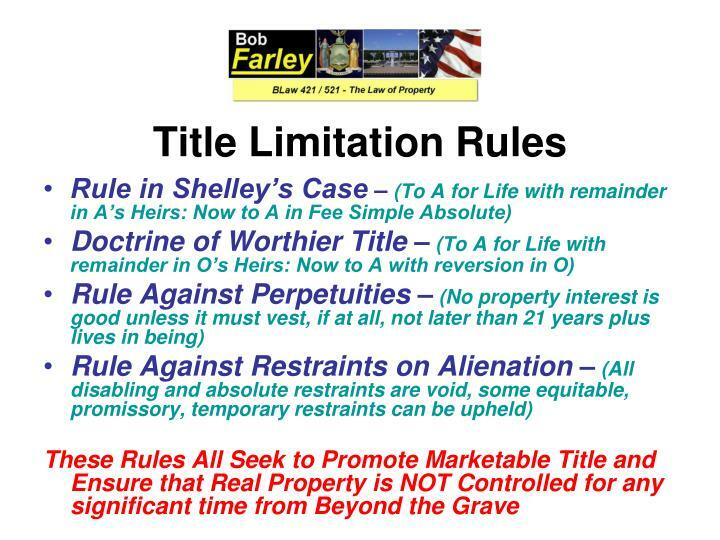 Zoning limits the use that may be made of property. 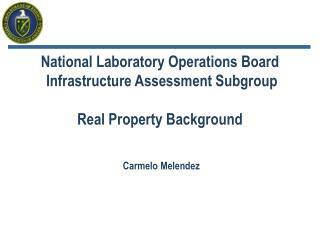 Usually an area is zoned for a particular use (such as commercial, industrial, agricultural, residential. 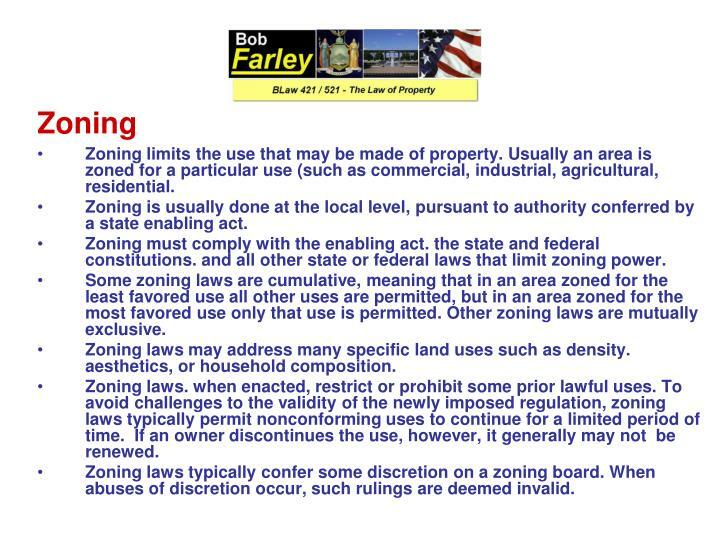 Zoning is usually done at the local level, pursuant to authority conferred by a state enabling act. Zoning must comply with the enabling act. the state and federal constitutions. and all other state or federal laws that limit zoning power. 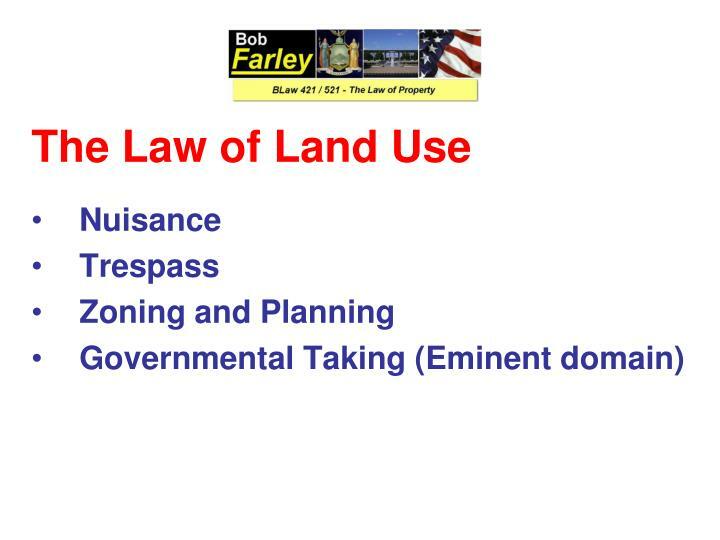 Some zoning laws are cumulative, meaning that in an area zoned for the least favored use all other uses are permitted, but in an area zoned for the most favored use only that use is permitted. Other zoning laws are mutually exclusive. Zoning laws may address many specific land uses such as density. aesthetics, or household composition. Zoning laws. when enacted, restrict or prohibit some prior lawful uses. To avoid challenges to the validity of the newly imposed regulation, zoning laws typically permit nonconforming uses to continue for a limited period of time. If an owner discontinues the use, however, it generally may not be renewed. 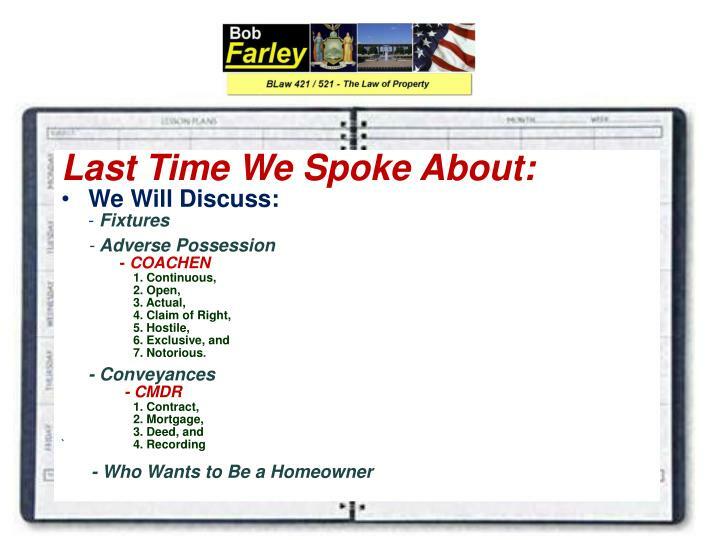 Zoning laws typically confer some discretion on a zoning board. When abuses of discretion occur, such rulings are deemed invalid. Variances from zoning can permit otherwise prohibited uses or deviations from density or area controls. 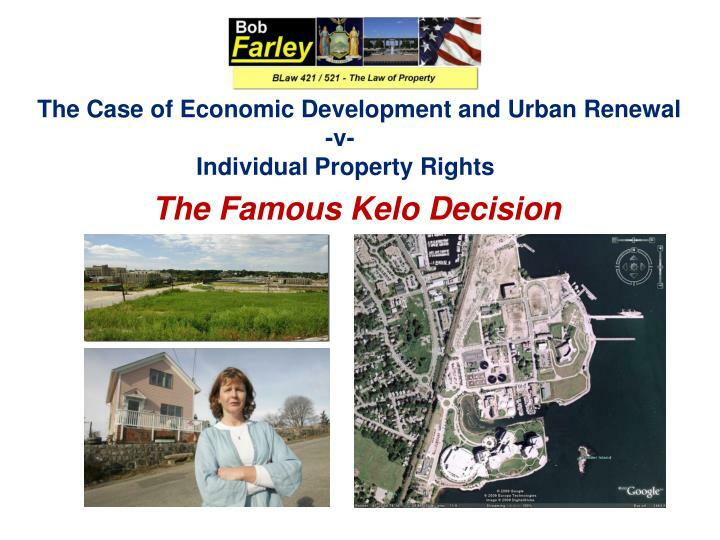 Zoning variances are granted only to alleviate undue hardships not of the applicant's creation. 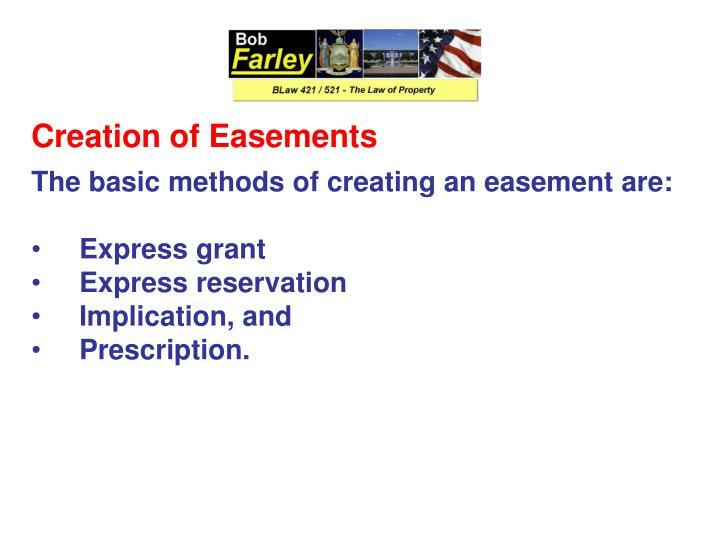 Exceptional uses are permitted by the zoning law under flexible criteria specified in the law. Zoning amendments present the problem of spot zoning, an amendment that confers benefits on a discrete parcel without any public benefit, and often in disregard of the comprehensive use plan that zoning is supposed to implement. Floating zones are uses that are not tethered to a specific area - the zoning board decides when the use becomes relevant where it should be located. servitude restricting use that is designed to produce public benefits. 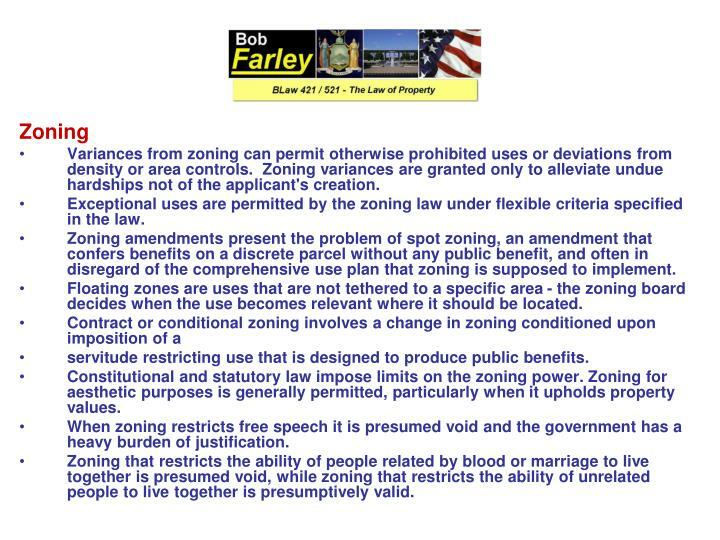 Constitutional and statutory law impose limits on the zoning power. 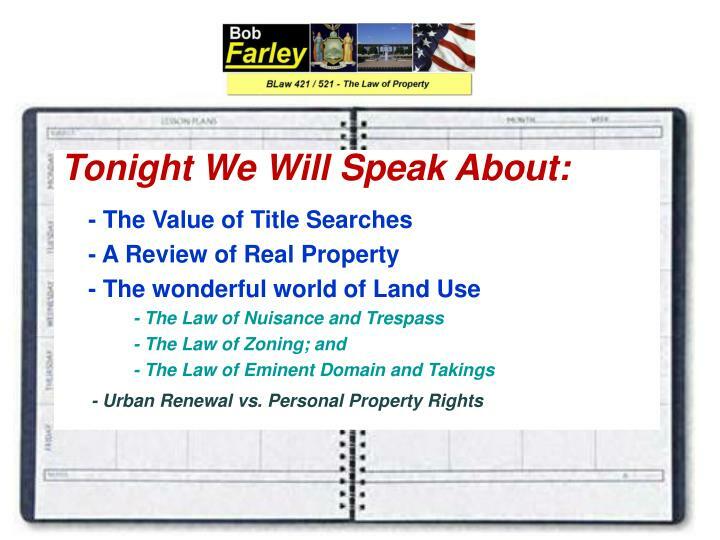 Zoning for aesthetic purposes is generally permitted, particularly when it upholds property values. When zoning restricts free speech it is presumed void and the government has a heavy burden of justification. Zoning that restricts the ability of people related by blood or marriage to live together is presumed void, while zoning that restricts the ability of unrelated people to live together is presumptively valid. 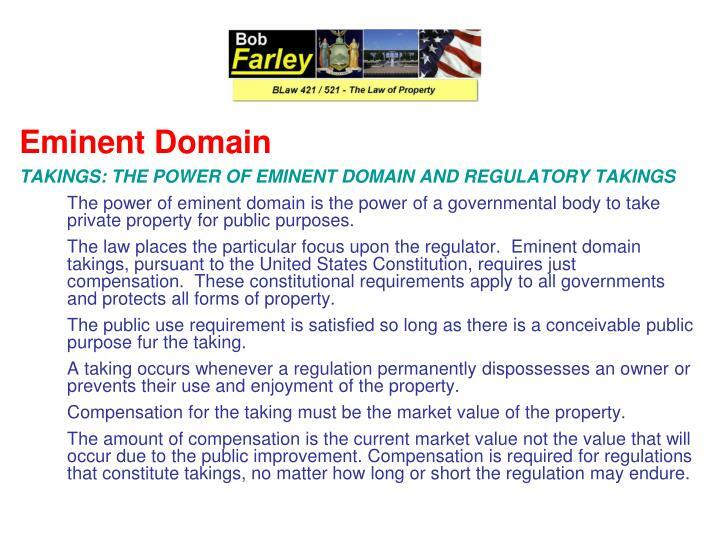 The power of eminent domain is the power of a governmental body to take private property for public purposes. The law places the particular focus upon the regulator. 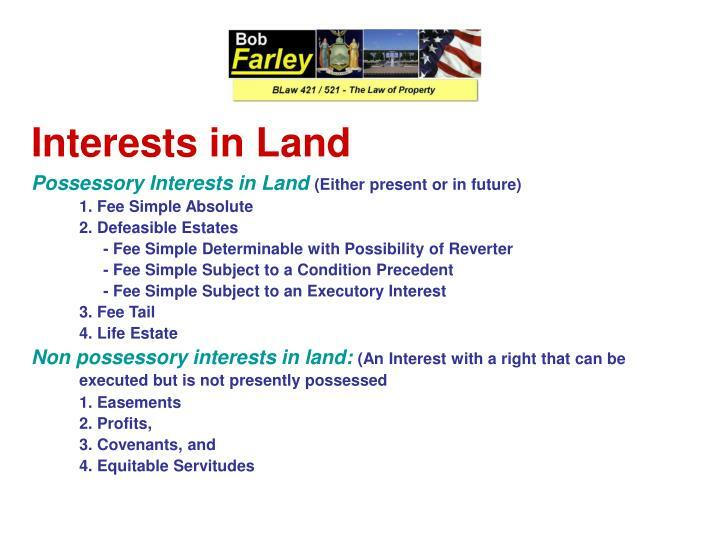 Eminent domain takings, pursuant to the United States Constitution, requires just compensation. 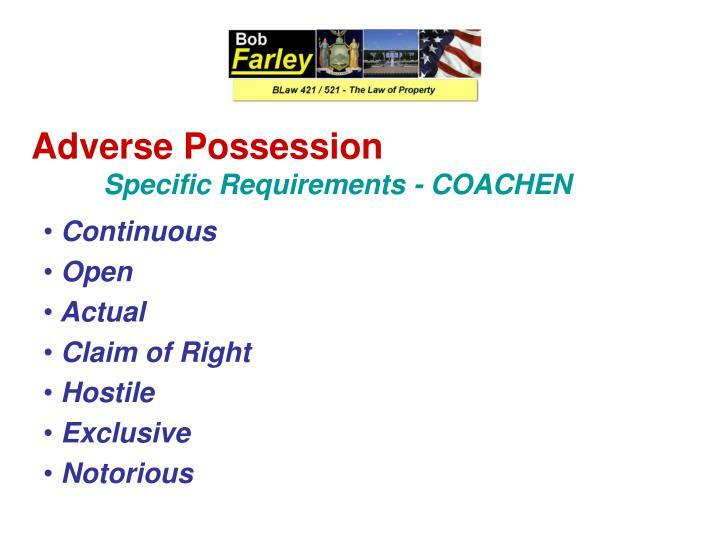 These constitutional requirements apply to all governments and protects all forms of property. The public use requirement is satisfied so long as there is a conceivable public purpose fur the taking. A taking occurs whenever a regulation permanently dispossesses an owner or prevents their use and enjoyment of the property. 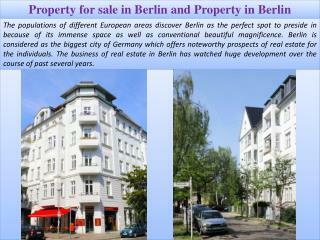 Compensation for the taking must be the market value of the property. 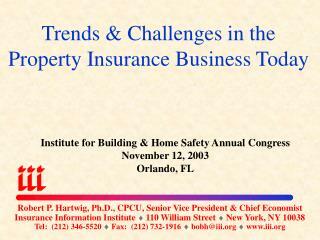 The amount of compensation is the current market value not the value that will occur due to the public improvement. Compensation is required for regulations that constitute takings, no matter how long or short the regulation may endure. 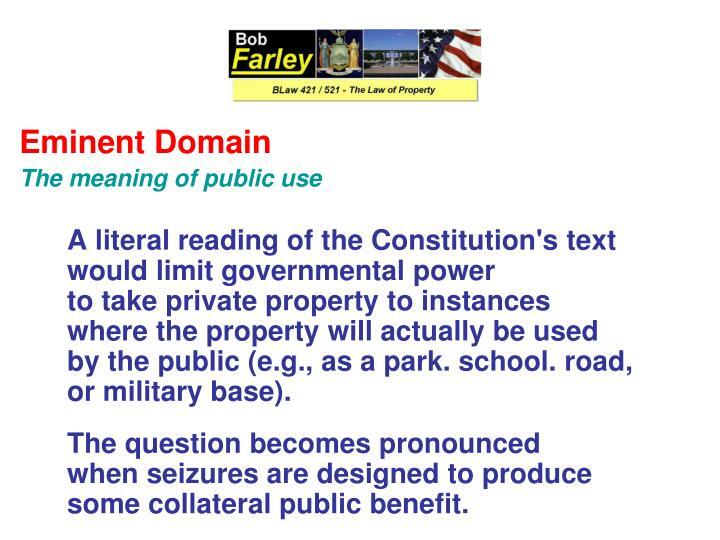 All governments in the United States have the power to take private property for public purposes, but that power (the eminent domain power) is limited by the U.S. Constitution, state constitutions, state statutes and judicial decisions. 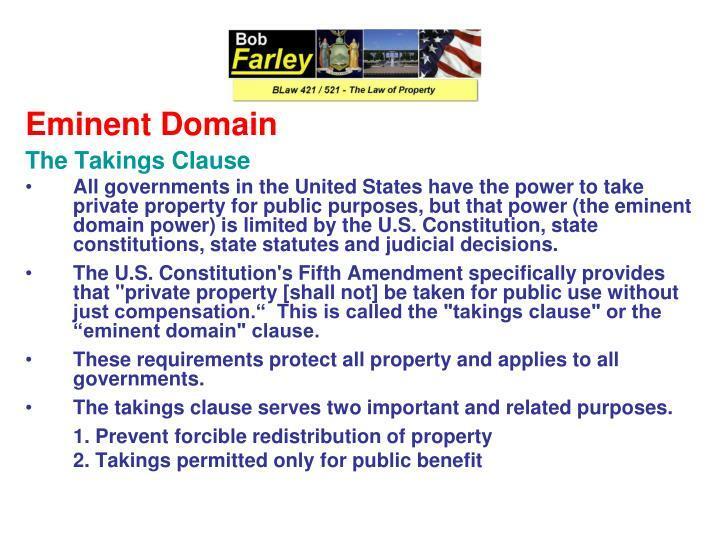 The U.S. Constitution's Fifth Amendment specifically provides that "private property [shall not] be taken for public use without just compensation.“ This is called the "takings clause" or the “eminent domain" clause. 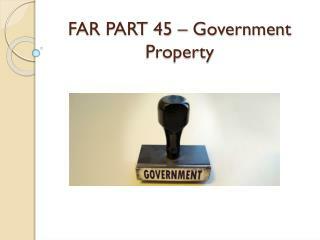 These requirements protect all property and applies to all governments. 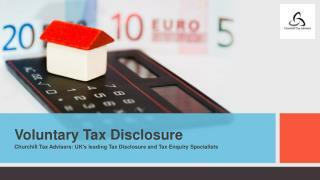 The takings clause serves two important and related purposes. For next time – Read Assignments for Classes One to Twelve on the Webpage. 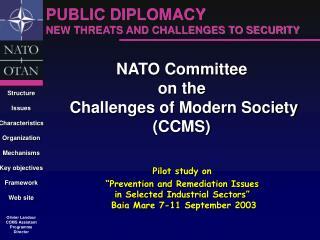 NATO Committee on the Challenges of Modern Society (CCMS) -Pilot study on “prevention and remediation issues in selected industrial sectors” baia mare 7-11 september 2003. nato committee on the challenges of modern society (ccms). 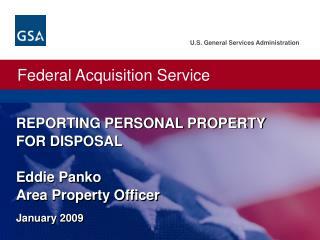 REPORTING PERSONAL PROPERTY FOR DISPOSAL Eddie Panko Area Property Officer -. january 2009. what is the disposal process???. 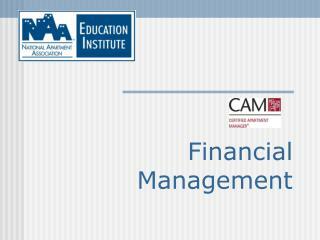 federal management regulations. 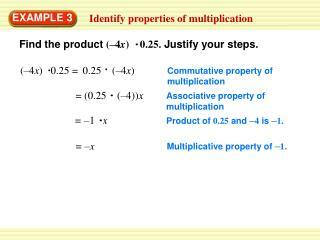 part 102-36 – disposition of excess personal property. federal disposal process. 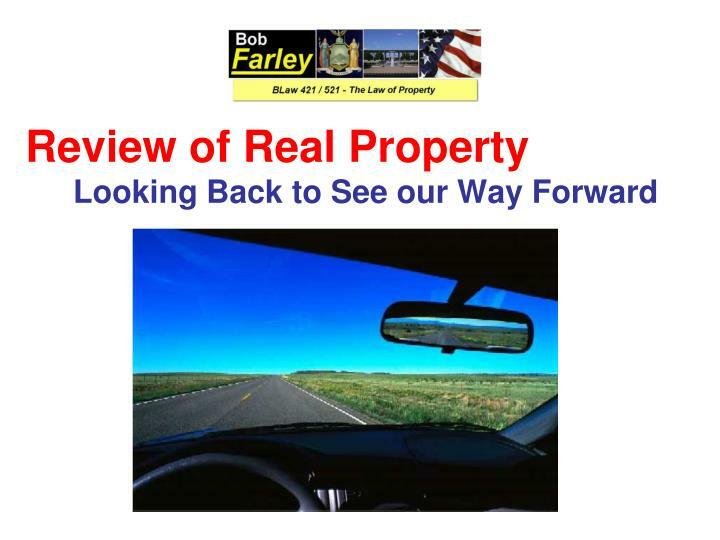 Reducing your property tax bill -. 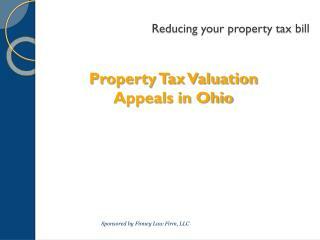 property tax valuation appeals in ohio. sponsored by finney law firm, llc. reducing your property tax bill. presenter:. christopher p. finney, esq. reducing your property tax bill. finney law firm, llc.